Dashain is a time when liquor sales soar as people drink to celebrate the festivities. Liquor store owners expect a surge in sales while consumers look for the best drink at affordable prices. Alcohol plays a big part in the festivities, as people consume copious amounts of alcohol to celebrate Dashain—the biggest festival of Hindus in Nepal, while alcohol is also used in traditional rituals. Nearly 20 percent of imported alcohol such as Johnnie Walker whiskeys, VAT 69, Absolut vodka is sold during Dashain alone, according to Roshan Shakya, sales manager of Carnival Enterprises—a reputed alcohol shop based in Jhocchen. He revealed that people have a strong preference for beers such as Gorkha, Tuborg and Nepal Ice. For whiskey, Old Durbar and Golden Oak. And those who like vodka gravitate towards Ruslan and 8848. According to Shakya, the best selling type of alcohol is beer followed by whiskey, vodka and rum. While demand for wine is still low compared to other alcohol, it is slowly rising. 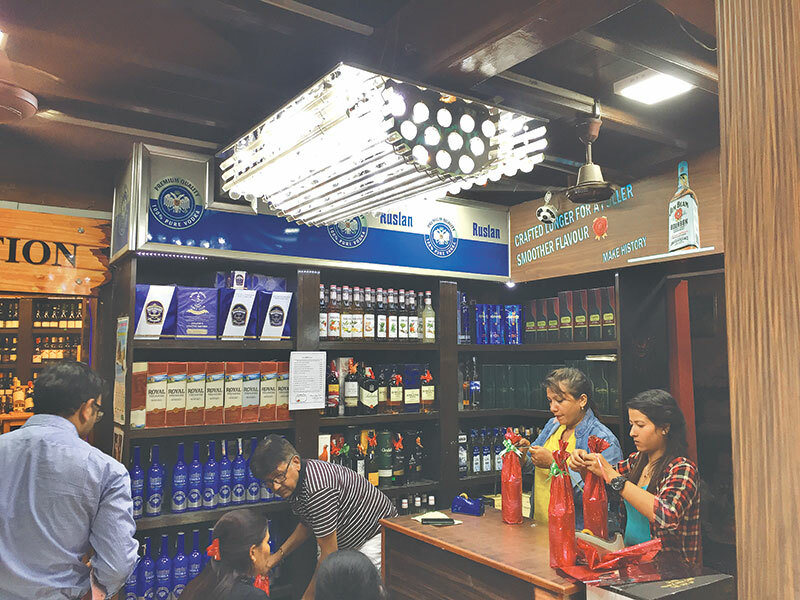 “Every year, we expect a spike in alcohol sales during the Dashain festive period,” said Amir Khand, owner of Mount Liquor, an alcohol outlet based in Jhamsikhel. He noted that alcohol sales usually surge from Phulpati onwards, the seventh day of Dashain, which falls on Wednesday. Domestic alcohol brands dominate the Nepali liquor market, said Khand. According to a senior official at Federation of Liquor Associations Nepal speaking on condition of anonymity, the domestic liquor market is estimated to be worth around Rs60 to 65 billion annually. Liquor stores register nearly 20 percent of their annual sales during Dashain alone. There are nearly 2,000 liquor stores in the Valley alone. Some of these alcohol companies have launched Dashain offers to boost sales. Some are offering customers a chance to win a live goat on alcohol purchases while others offer discounts on combo purchase of different alcohol types. Alcohol suppliers are continuously delivering stocks to liquor stores such as Carnival Enterprises as alcohol sales start to spike. Demand for imported alcohol from brands such as Johnnie Walker, Jack Daniels, Famous Grouse, Absolut, Chivas Regal and Malibu rises during the festive period, said Meneka Shakya, owner of Carnival Enterprises. While demand for alcohol continues to rise, prices for both domestic and imported alcohol continues to inch up. “Domestic alcohol prices have risen by nearly 20 percent while imported alcohol is dearer by nearly 4 percent,” said Shakya. domestic and imported alcohol has some worried. “Demand for imported liquor may decrease this Dashain as prices of alcohol have gone up,” said Sunny Tibrewal, manager of Green Line Centre—a company dealing in quality wine, whiskey, liquors, cigarettes and cigars. But even with the price hike, alcohol orders for Dashain have already streaming in, highlighting the potential for strong sales, according to Tibrewal.